All of us at CNN are counting down the days to the launch of our newest bureau and production facility. After Atlanta, London and Hong Kong – Abu Dhabi is set to be our fourth broadcast hub when it launches on November 3rd. We will have a nightly newscast from there called Prism hosted by Stan Grant so be sure to tune in! We'll bring you a behind-the-scenes look at how the bureau came together on the next IME airing November 4. Meanwhile, here's a sneak preview! CNN's Paula Hancocks reports on the lack of water in Gaza refugee camps. Become an IME fan on Facebook! Remember you can also upload i-Reports that we can use on air – check out our main site cnn.com/ime and feel free to e-mail our team directly at ime@cnn.com with any any story ideas. TEHRAN, Iran (CNN) - Three days of mourning began in the Iranian province of Sistan-Baluchestan on Monday, after dozens of people were killed in a militant attack a day earlier, state media reported. 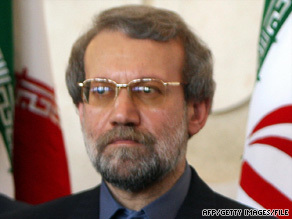 Iranian parliament Speaker Ali Larijani calls a suicide bombing 'the result of the U.S. actions. A man carrying explosives blew himself up Sunday as participants headed to a conference between Shia and Sunni groups in southeastern Iran, killing at least 42, state-run Press TV reported. The blast in the city of Sarbaz, in Sistan-Baluchestan, wounded 28 others, the semi-official Fars news agency said. CNN's Ivan Watson reports from Turkey on the soccer game that could bring Turkey and Armenia closer together. (CNN) - Salwa Salah was 16 years old when she was arrested by Israeli forces and jailed for seven months. Salah was held under administrative detention – detention without charge or trial. It is legal under international law which permits its use only in exceptional cases to protect the security of a state. Ivan Watson reports on one Turkish taxi driver's mission to catalog his city's poorest.